tional needs of 10 girls who receive education in Anatolia through ÇYDD every year. change in four working groups: re-                                  childcare provision is crucial for improving       tion. 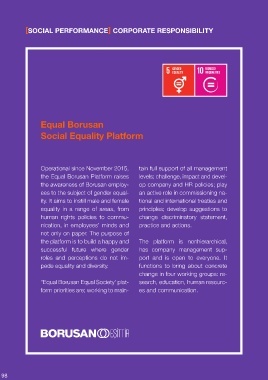 “Equal Borusan Equal Society’ plat-         search, education, human resourc-                                   the employment of women in Turkey. These centers facilitate women’s employ-           Balıkesir.